Mich L. in L.A.: Love Me, Love My Jeans! Love Me, Love My Jeans! In honor of Michele's cool event, I wanted to share an idea that tweaks one of my very early tutorials. Does anyone remember my shabby chic Jean Seam Wrap Bracelet? I am way giddy about it. I just love wearing this thing. That's a twofer. And really, who doesn't love a twofer? Oke doke, thanks for visiting today, you guys. Check back soon for some more upcycled DIY! Michelle I could hug you! Thanks so much for the awesome plug! It feels like having a sweet supportive sister (with the same name and everything..) out there in blogland crafting her own wonders with jeans! Adding the flower makes total sense. But extending the bracelet to make a stem? I never would have thought of that in a million years. SO good! & The super dooper Michele is always awesome,its really cool to be her follower. Me encanta el tutorial, con la flor es todavia mejor y la idea de las flores para la casa es fantastica, tengo que encontrar flores de crochet!!!!! That's very cool - I might convert it into a hair accessories for pony tail. Love it! So cool! I love upcycled denim! Ever since winning a book cover contest in grade 5 for a slip on book cover I made with a pair of my jeans and a Frog painted with Tri-Chem (weird fabric pens of the 70's) on the pocket, I've been in love with jean as a craft medium. Even made a rag rug out of jean when I was first married. Really looking forward to seeing the new ideas. Jean is such an iconic material. It is a great material to use again in a new way! Love this tutorial and the simplicity of it. Somehow I missed it the first time you posted it. Oh my goodness how clever and cute! I love it!! Especially with that adorable pink flower. Nice job! 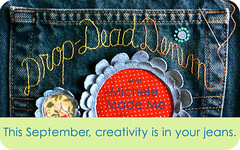 I would love for you to come by and link this up to my new diy fashion linky party called DIY Diva Thursdays! We party until Monday...come on by! I missed this tute the first time around so I'm glad to catch it now. And this, as always, is too stinkin cool! Now I need to find some thrift store grapes! Vow..this ideas is really great and wonderful. Its amazing and i liked it very much.